What’s a trip abroad without souvenirs? Souvenirs are not just gifts for friends and relatives, but also a keepsake, a part of the country which you have visited. In Uzbekistan where culture mixed nomadic and farming traditions you will find a lot of Uzbek souvenirs to be taken with you. 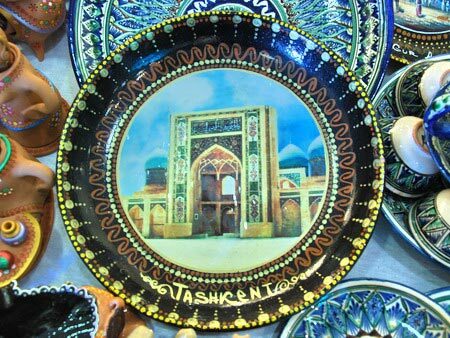 What souvenirs can be purchased in Uzbekistan, and where to buy, for example, ceramics or Uzbek carpets? 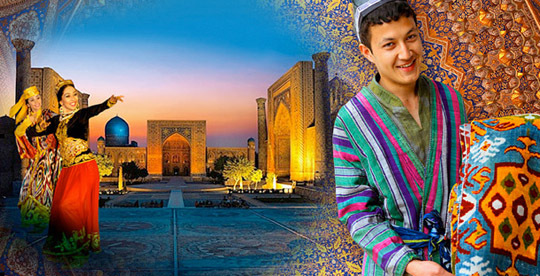 Traveling along ancient Uzbekistan cities of Samarkand, Bukhara and Khiva you will find that every city has its own craft school and own style, different from other regions. Visiting Khiva, you can buy a lagan-dish or a badia-plate decorated with blue and ultramarine patterns with wide horizontal rims, which can be hung on the wall at home. A Khorezm Hum-vessel can be used as an original vase. Amazing Chiroki-lamp will create an environment of the East at your home. 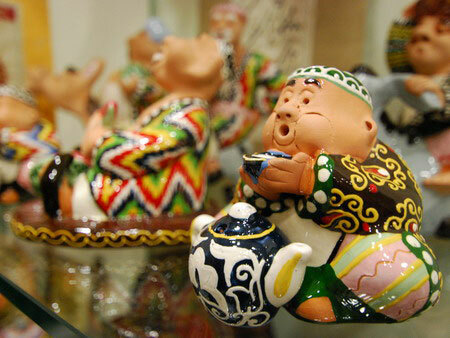 Enthusiasts of ceramics should visit the famous center of ceramics in Uzbekistan, Rishtan town. Being there, do not forget to visit one of the craft shops and to buy some pottery of all blue and turquoise shades. Rishtan lagans and figured vessels in the shape of a duck, “obdasta urdak”, decorated with antique ornaments of pomegranate and almond flowers are traditional Uzbekistan souvenirs. 40 km from Bukhara there is a small town of Gijduvan, which is famous for its yellow-brown ceramics with green and blue patterns. 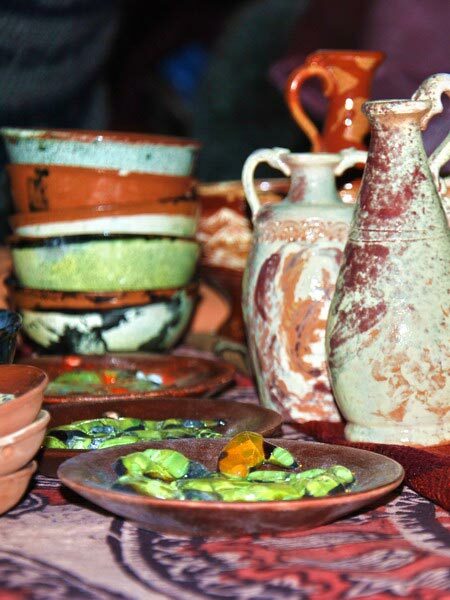 Here you will find a renowned ceramics center of Nasrullayev family, who passes the secrets of pottery craft to the 60th generation. Average prices in this center are $3 for piala, $5 for kosa and $7-8 for lagans. Almost in every Uzbek bazaar you will find shops selling knives, daggers and even swords, adorned with decorative carvings. Traditional Uzbekistan souvenir is a “pichok” knife, which has a peculiar form of a blade and handle. The most famous knives are made by Chust masters. Light and elegant, they have a curved up blade and dipped handle. Dark blade steel clanks in light collision and the sheath is decorated with a cloud patterns. The blade features the engraved Arabic inscription: Estalik uchun Chust - In memory of Chust. Jewelry is one of well-developed areas of metal carving. Jewelry ofTashkent, Bukhara or Samarkand craftsmen are in demand not only as Uzbek souvenirs, but also as bijouterie for special occasions, where you can show off the originality and uniqueness of the image. Traditional “Kashgar-Boldak” earrings and domed earring with tinkled pendants, silver bracelets with cornelian, necklaces with delicate beads and turquoise will complement your modern outfit and give an oriental beauty to your image. 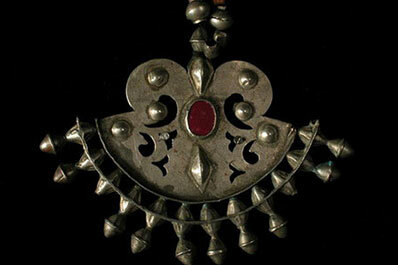 For Uzbek people jewelries are not only a decoration, but also an amulet. For instance, tumor is a silver or gold box with an engraved prayer, featuring a prayer-talisman or a miniature Koran inside it. 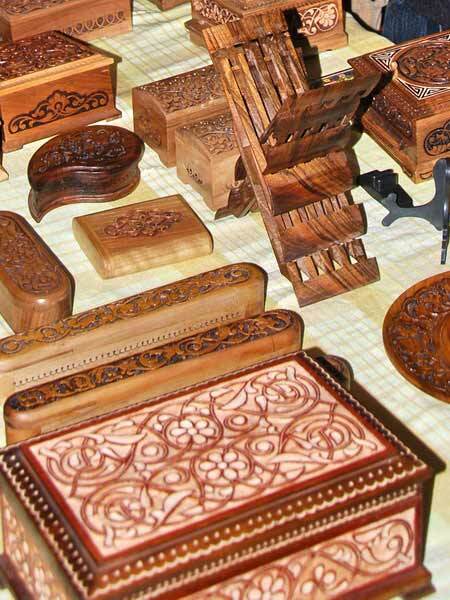 Visiting Uzbekistan, it is impossible not to pay an attention to many articles made of carved wood. Uzbek masters perfected the art of ornamentation in wood carving and painting. From time immemorial, ancient Asian buildings were decorated with carved wood columns and massive doors, where the intricate floral pattern often featured the name of the master. You can buy a carved table with stools from elm, walnut and juniper for your living room. Collectors of oriental souvenirs should buy a laukh, a stand for books, which is carved from a whole solid wood bar, without any fasteners and hinges. Carved or painted fine wood boxes, painted with “islimi” floral ornaments will catch women’s fancy, because they can be used for jewelry, makeup and other women's stuff. 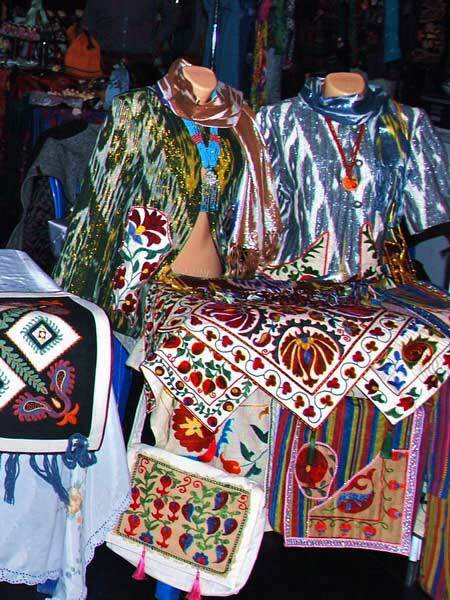 Uzbek embroidery is noted for originality and uniqueness. The most skilled embroiderers are from Samarkand and Bukhara. Famous Uzbek Suzannes resemble beautifully embroidered carpets. 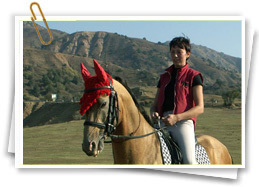 Especially it is worth to say about golden thread embroidery. Nowhere else you will find such skilled golden thread embroiderers like inBukhara. Exotic embroidery will be a perfect decoration for any house.Kashkadarya embroiderers are noted for nice handbags, decorated with colorful national embroidery. Bukhara also is famous for fur coat and karakul fur hats. Warm, thick and shiny fur of Bukhara karakul sheep has a refined appearance and healing properties. 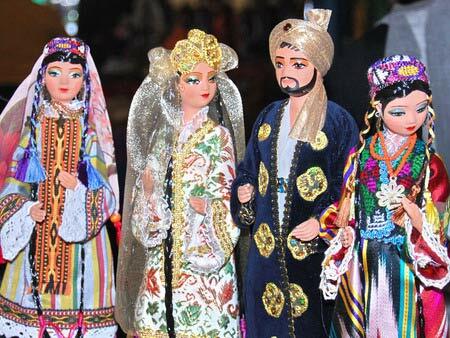 Traditional holiday clothes can also be a great Uzbek souvenir. These are a men's robe, "zarchapan", or women’s coat, "kamzul", decorated with golden thread embroidery. 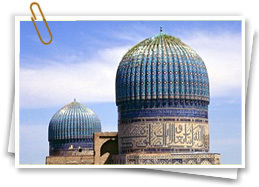 But the main souvenir for all guests coming to Uzbekistan is a tubeteika, skullcap, traditional Central Asian headdress. 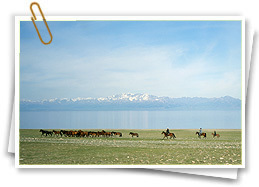 Each region of Uzbekistan has its own kind of tubeteika. Traditional Chust tubeteika, made from black satin with a white pattern of four peppers, are an obligatory accessory of men's national dress. But not only men wear this hat. 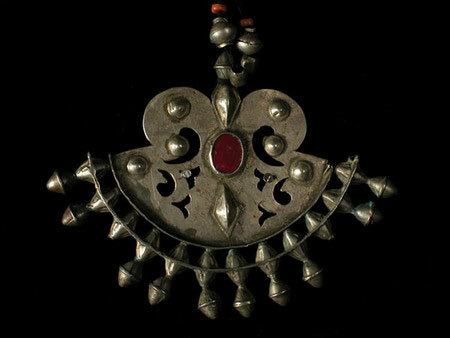 Uzbek women traditionally adorned their skullcaps with various ornaments and even with precious stones. 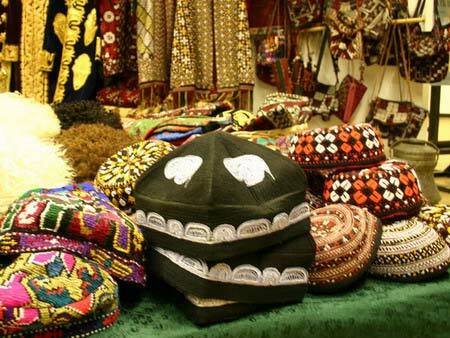 Women's skullcaps are very colorful: Bukhara skullcaps are traditionally embroidered with golden thread. 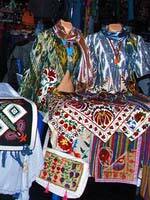 Most famous Uzbek fabrics are abr and ikat, cloud-like silk fabrics with blurred patterns. Silk, made in Margilan, is one of the most famous Uzbek national fabrics, along with khan-atlas and adras. Uzbek carpets are renowned for its beauty and high quality. Khiva, Bukhara, Samarkand, Kokand, Shakhrisabz, Karakalpak carpets and rugs are differed in techniques, patterns and purpose. Hand-woven carpets, made from natural fibers are quite valuable and expensive. Traditionally, rugs and carpets are not only laid on the floor, but also decorate walls of houses. Samarkand silk carpet is famous for its natural soft and contrast pile, luxurious colors of which make it desirable to any interior. 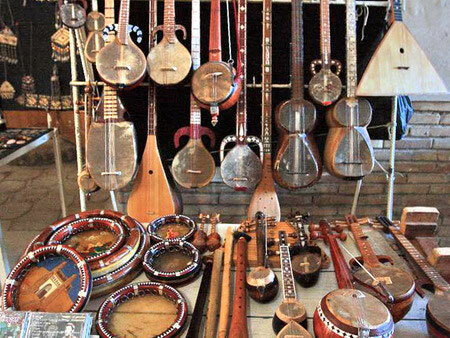 Traditional Uzbek musical instruments can become a very unusual Uzbek souvenir or even a subject for a collection. Strings, percussion and wind instruments: kobuz, dombra, dutar, tanbur, ud, rubab, surnay, karnay, doira and many others are decorated with elegant patterns and provide rich deep sound. A bottle of wine Uzbekistan may also be a good souvenir from Uzbekistan. 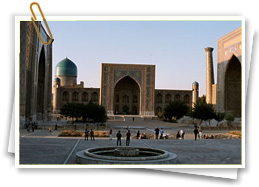 Uzbekistan is famous for Samarkand winemakers. In Samarkand, tasty Uzbek wine is sold in shops near attractions; sometimes small wine shops hold “shows” of Uzbek wines tasting, where for a small fee you can try white and red, sweet and dry, dessert and table local wine. 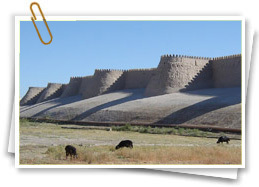 Also, the famous capital of the Tamerlane’s empire is noted for Samarkand paper, based on technologies of 10th-11th centuries and made from mulberry bark, silk fibers and flower petals. The Samarkand paper was in great demand due to its smoothness and color, but its main quality was the durability. The majority of documents written on the Samarkand paper preserved in good state up to date and are still kept in different museums of the world. It was this paper which was used by calligraphists for the texts and artists for the miniatures. The Samarkand paper was also preferred in book production. The rich and unique culture of the East does not leave anyone indifferent. Original souvenirs from Uzbekistan are a decoration of any house and bright memory of Central Asia. However, you should remember that in Uzbekistan, as in any other country, there are bans and custom restrictions on the export of art objects and antiques, which age is 50 years or more and are of cultural value. 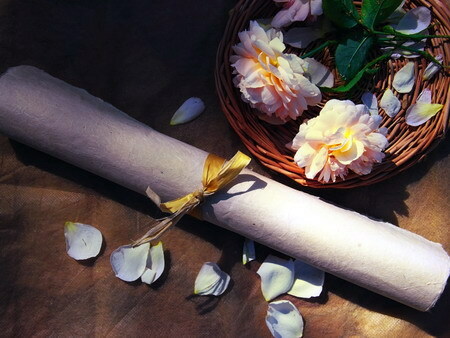 Therefore, buying paintings, carpets and other pieces of art as a souvenir, it is better to have a receipt confirming that the subject is not an antique and does not have a historical or cultural value, as well as a certificate to export the subject with a photo and description.